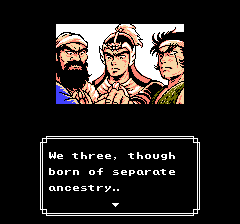 Gameplay wise, the game starts at a later point than the previous game, and there’s some assumptions about how much the player knows of the story of the Romance of the Three Kingdoms. 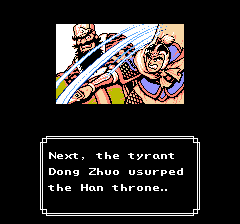 For example, the introduction to the game mentions the death of Dong Zhuo and implies that he’s a tyrant. In typical depictions, Dong Zhuo is a cruel perverted tyrant, and an easy man to loath. If you’re familiar with the canon, you instantly know who Dong Zhuo is, and why it’s good that he’s dead, and you know about the main events of the novels. Similarly, you don’t get a lot of details about who you’re fighting. I don’t mind it, since it’s not that hard to look up exactly who someone is, but I can see it being a negative for people who don’t know what’s going on. Dong Zhuo, on the left, dies before the game begins. This could be his foster son, Lu Bu, on the right, who participated in his death. Even without a lot of knowledge, the game does have some good tricks. For example, when leaving the first area, your sworn brothers, Guan Yu and Zhang Fei, join your party. It’s surprisingly effective to get a “Your brother joins your side” kind of message. Similarly, it really does make you feel like you’re a hero when people welcome you and call you a lord in shops. Cao Cao, according to people in town, is a scheming and dangerous man. 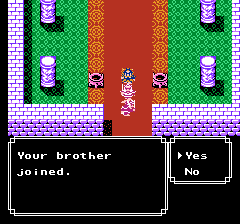 Starting the game with your brothers joining your side is surprisingly effective. Difficulty wise, the game starts out with an easier curve of difficulty. 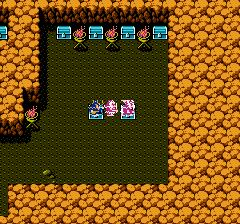 I can literally get to the first mini-boss and win with a good amount of ease by just picking up some armor at a cave to the north, and sleeping after I gain a level to refresh my troops. The lack of rations makes it easier to explore with a greater radius since you don’t have to worry about buying more food or choosing armor or food. You also start with a better supply of armor and equipment. A short walk from the first town gives you a trove of money and items. As for looks, the game is more detailed than the previous game. I haven’t seen any amazingly detailed effects, but it’s definitely not ugly. The music is pleasantly catchy, and the auto-battling system is still a charming and nice feature. The enemy attack rate feels a little high, but it’s not too annoying since I haven’t had to grind and the auto-battling is pretty painless. The water simply flashes between two colors, but the detailed structure of the tiles makes it really look like waves. 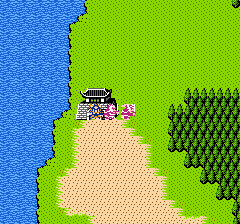 Here, the party heads out looking for Yuan Shu. I can see why people say it’s better to start with this game instead of the previous one. It still has some retro styled elements (slightly wonky item management, needing to use the menu to talk, and typical NES style graphics.) However, the catchy music, the auto-battling system, and the speed of getting you into the meat of the game is pretty notable. 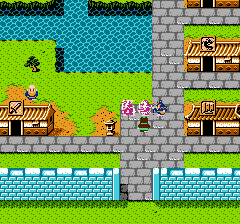 The layout of the first town requires some mild walking if you want to sell items (it's the shop above the dragon sigil house.) However, it's got wide paths (so NPCs aren't a problem,) and a convienent inn.